As the oldest city in the Hawaiian island chain, the town of Hilo offers a unique peek into the history of Hawaiʻi, making it a sought-after destination for tourists and visitors. 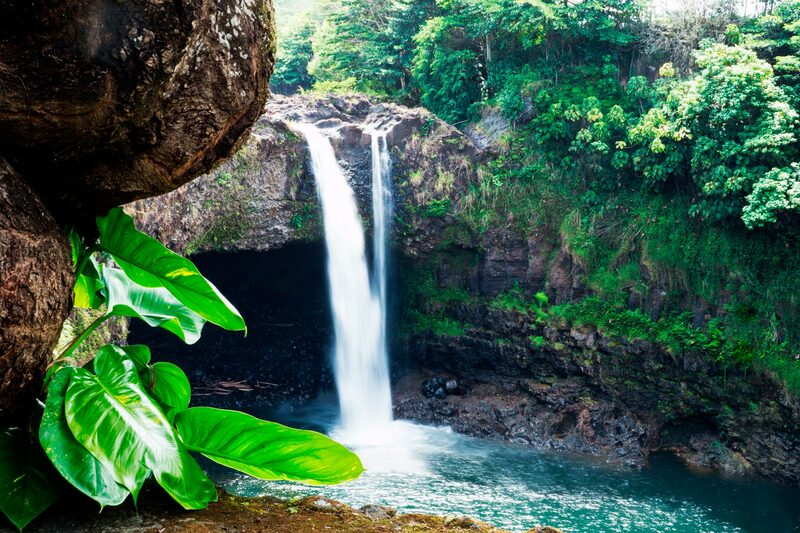 The Hilo region is also the wettest side of Hawaiʻi Island, known for having dramatic natural landscapes and vistas, including waterfalls, miles of rainforest, and lush gardens. Hundreds of years ago, Hilo was known as a farming and fishing area, before evolving into a commercial center for the sugar industry. Today, you can easily spend a whole day just exploring. Take a stroll through Downtown Hilo and pop into the shops and services along the bay front on Kamehameha Avenue. Don’t forget about the side streets- they’re also packed with hidden gems and interesting finds! The vibrant town is home to a variety of unique local shops such as Big Island Candies, Hilo Hattie and Sig Zane Designs, as well as art galleries and museums. The Pacific Tsunami Museum is the only museum of its kind in the state, offering both human stories and scientific explanations through its exhibits and content. Hilo is also home to the country’s only rainforest zoo, Panaʻewa Rainforest Zoo. Fun for the keiki and the whole ʻohana, the zoo features exotic plants and animals, including a white Bengal tiger. The island’s general art museum is located in the historic Hilo Iron Works building, which boasts stunning views of Hilo Bay. The Pacific Tsunami Museum is the only museum of its kind in the state, offering both human stories and scientific explanations through its exhibits and content. The area’s natural beauty is impossible to miss. Right on Banyan Drive near the area’s major hotels is Liliʻuokalani Park and Gardens. Waianuenue and Peʻepeʻe Falls (also known as Rainbow Falls and Boiling Pots, respectively) are stunning waterfalls located in Wailuku River State Park. Then there’s Kaumana Springs and Cave, a 25-mile long lava tube formed by the lava flow of Mauna Loa hundreds of years ago. Other must-see spots include Wailoa River State Park and the nearby Hawaiʻi Volcanoes National Park. Surf culture is big in Hilo, but there’s plenty of ways for everyone to enjoy ocean activities. Richardson's Ocean Park is one of the neighborhood hot spots. Grab some snacks and lay down a blanket for a picnic while watching the waves, or throw on your snorkel gear and explore the area’s exotic marine life. A popular swimming spot is Carlsmith Beach Park. While there’s no sandy beach, the water acts as a salt water swimming pool, protected from turbulent waves by a large reef. There’s also a large grassy area great for lounging in the shade with a book. Picnic tables make it easy to sit and have lunch with friends and family. No matter your motivation, a visit to Hilo allows you to experience the aloha of old Hawaiʻi and ensures an authentic taste of island life.